Explanation: (A) Note that (p ∧ ~q) ≡ ~(p -> q). So it means rainy day to cold implication is false for all days. Which means non-rainy days are cold. (D) Note that (p ∧ ~q) ≡ ~(p -> q). 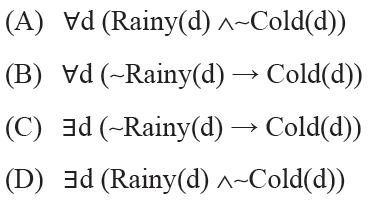 So it means rainy day to cold implication is false for some days. Which means not all rainy days are cold.